For July 4th Hoa and I we flew to Las Vegas for a couples of days just for a change of scenery! 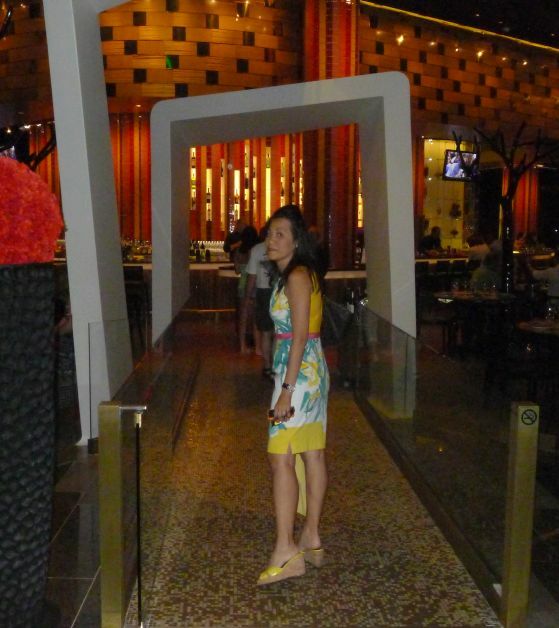 There are so many things to see and do in Las Vegas but for this trip I am concentrating on shopping and dinning. 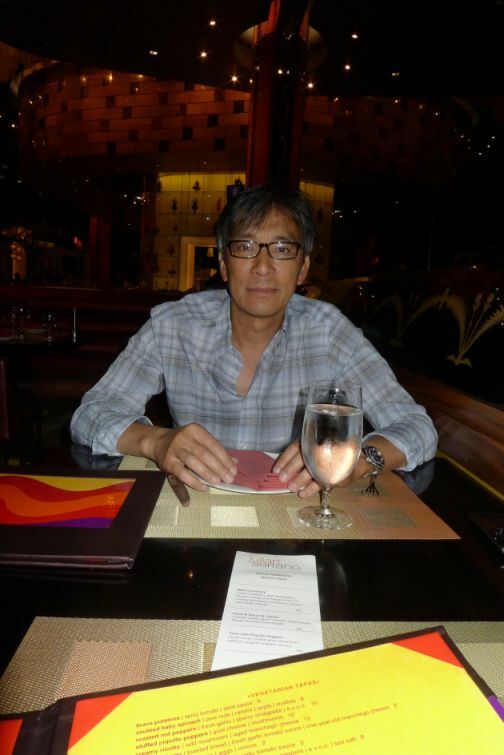 There are so many good restaurants in Las Vegas but lately we are always going back to the one we are familiar with. This time I wanted to try out new restaurants and get out of our comfort zone and be a little bit more adventurous! I selected Julian Serrano and Fleur by Hubert Keller for the two evenings in Vegas. After a day of shopping we are heading to Julian Serrano for our first evening in Vegas. 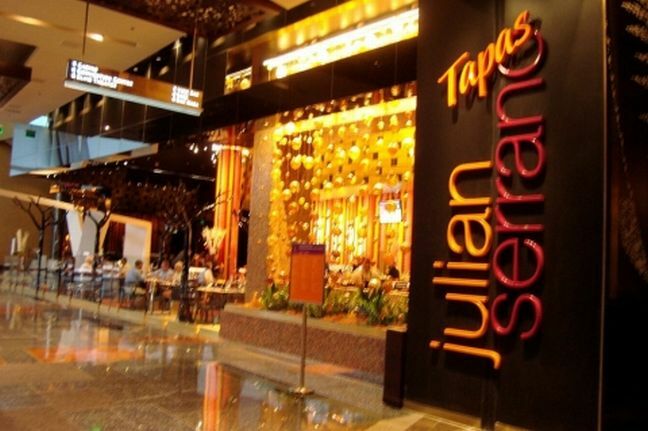 Julian Serrano is a Spanish Tapas restaurant located in the new Las Vegas City Center Aria Hotel. If Julian Serrano name sounds familiar it is because he is the executive chef at Picasso restaurant, the two Michelin stars and AAA Five Diamond Award located at the Bellagio Hotel. 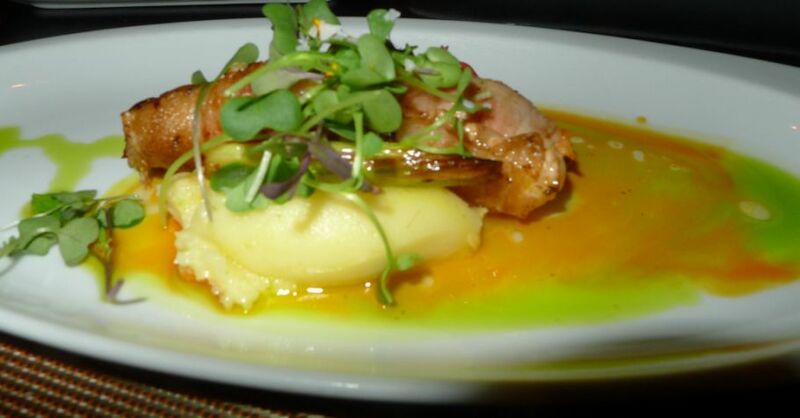 Serrano is probably best known for revolutionizing high-end dining in Vegas with his Picasso restaurant. 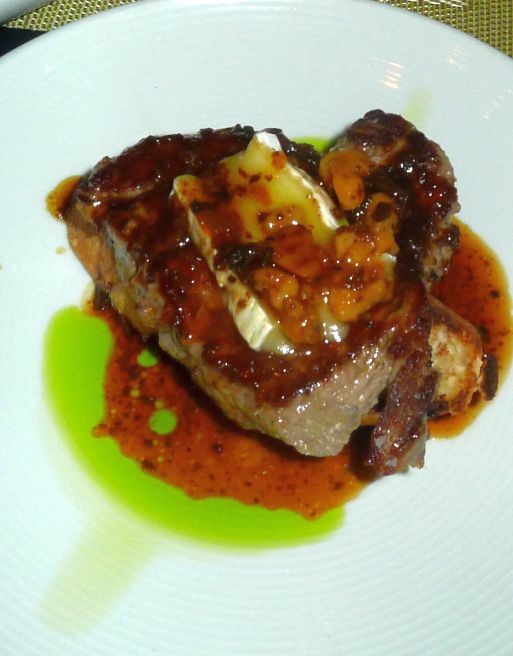 Prior to Picasso, Serrano worked at the famous Masa, a Michelin star French restaurant in San Francisco. 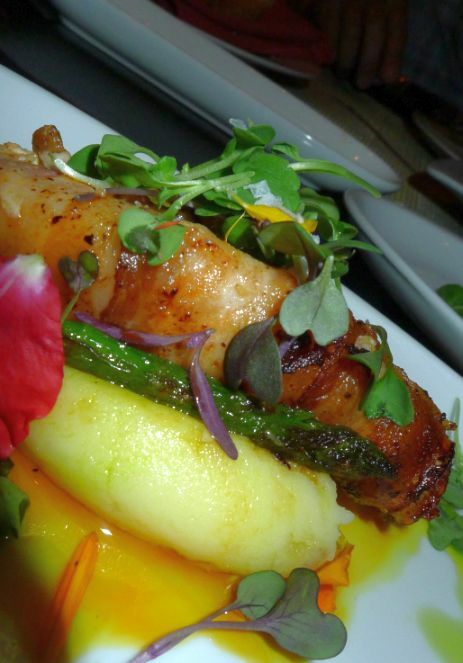 Serrano was awarded the James Beard's "Best Chef of California" trophy in 1998 and he received his second James Beard award, for "Best Chef in the Southwest. 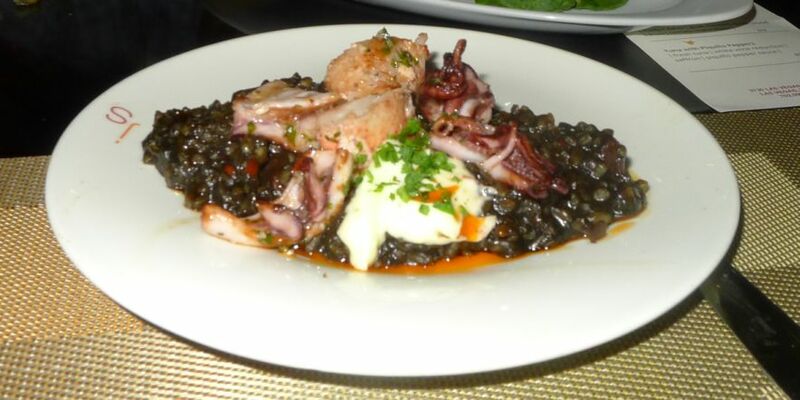 Serrano opened his eponymous restaurant in late December 2009 during the down-market/recession and the menu translate to affordable price ranging from $8 to $15 for small plates and $40 for a paella for two. Julian Serrano is definitely a departure from Picasso and Masa which are targeted to high end clientele but here at Julian Serrano the food is more for the mass with affordable price and good service (I included the price for each plate below for you to see). 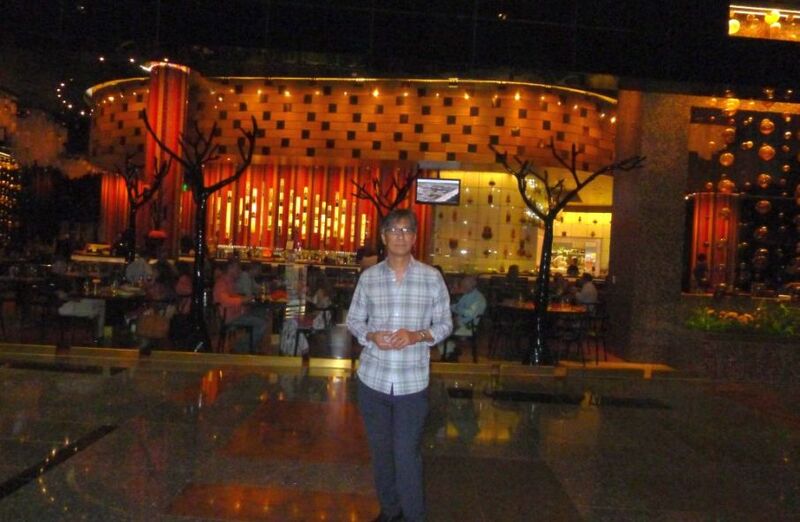 At Julian Serrano you can stop by for a beer and have a few small plates as snacks or you can have a complete meal. With his Tapas menu Serrano started the small-plates trend which are become increasingly more popular because of the flexibility and the social aspects of a shared dinner! 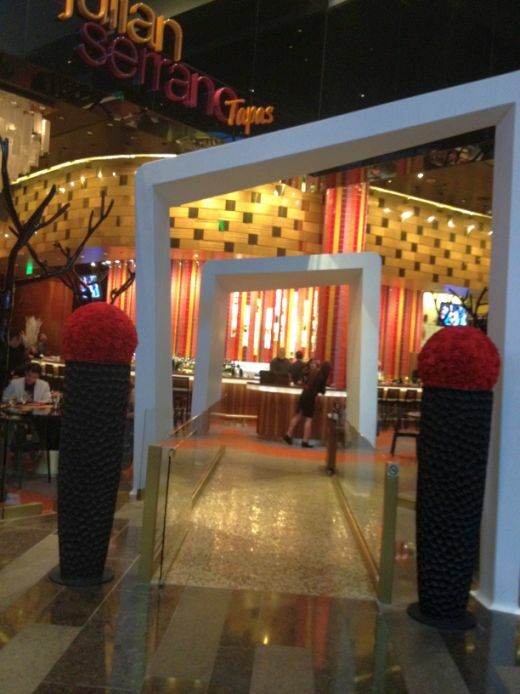 Julian Serrano is located right next to Hotel registration inside the Aria Hotel. 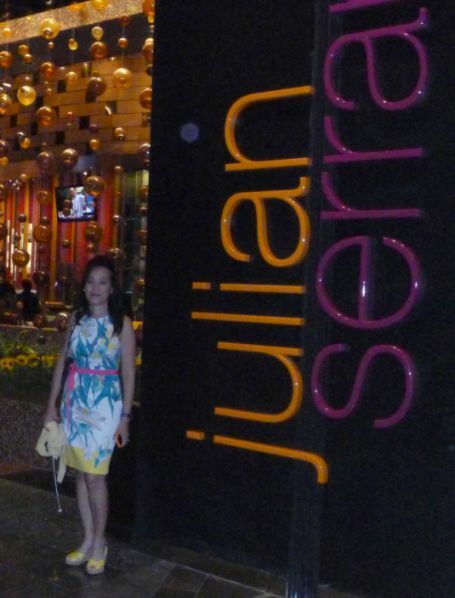 The first thing you see as soon as you walk in the front lobby is the big and colorful neon display of Julian Serrano. 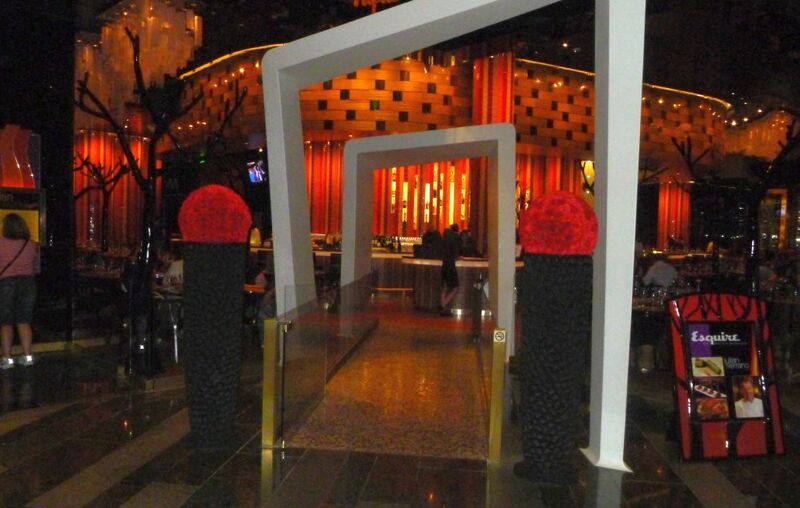 The front of the restaurant is very colorful and has a pretty casual and friendly atmosphere. Beautiful Murano glass trees line the dining room and a large wrap-around bar is perfect for enjoying a glass of freshly made sangria. For decoration there are faux black shinny trees and tables, Spanish music, glitzy vibrant colors, shelves of ornamental glassware, fancy red booths, open kitchens, an warm lighting. Enter the restaurant under the large white arches and select which ambience you prefer: the casual, open seating in the front or the more elegant and romantic dining room further back. 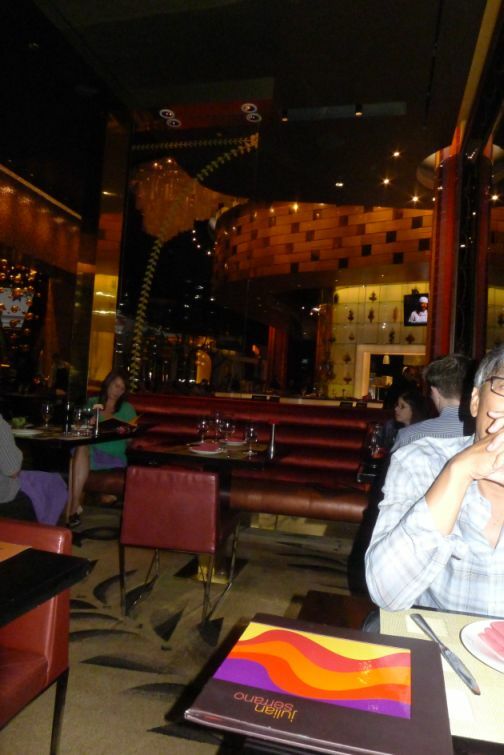 We choose to sit in the romantic dinning room in the back. The cover of the menu is colorful! From our table we could see the open kitchen and the chefs at work. 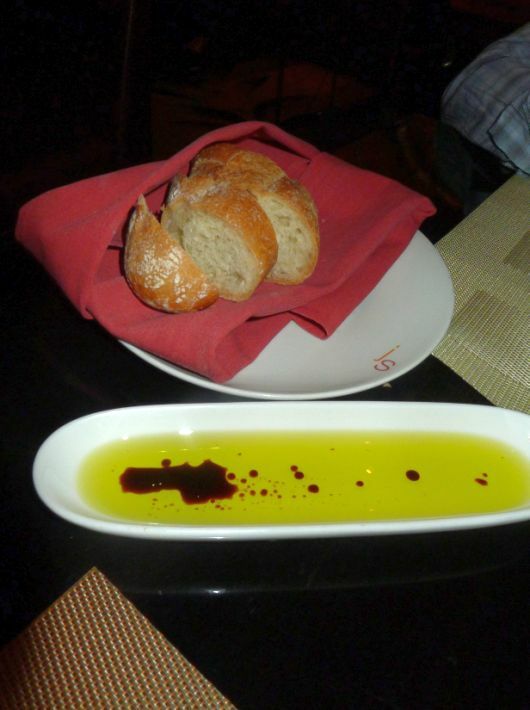 Bread with olive oil and balsamic vinegar are brought out, compliment of the house. 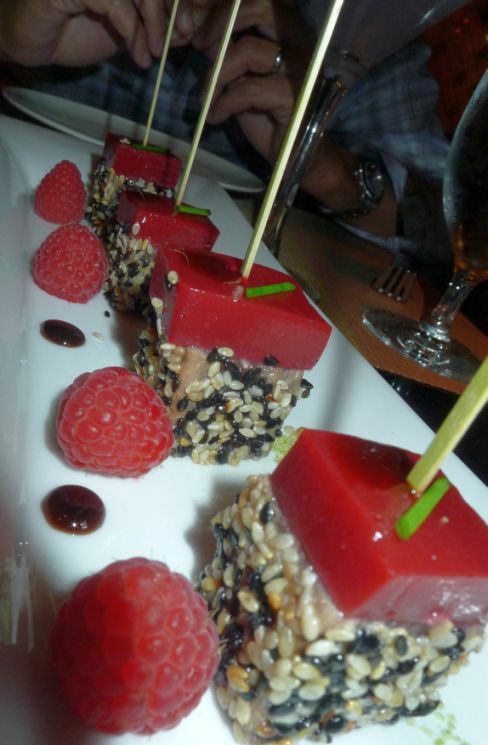 Ahi tuna, molecular raspberry, wasabi and sesame seed. This plate looks really interesting by fell short of taste! 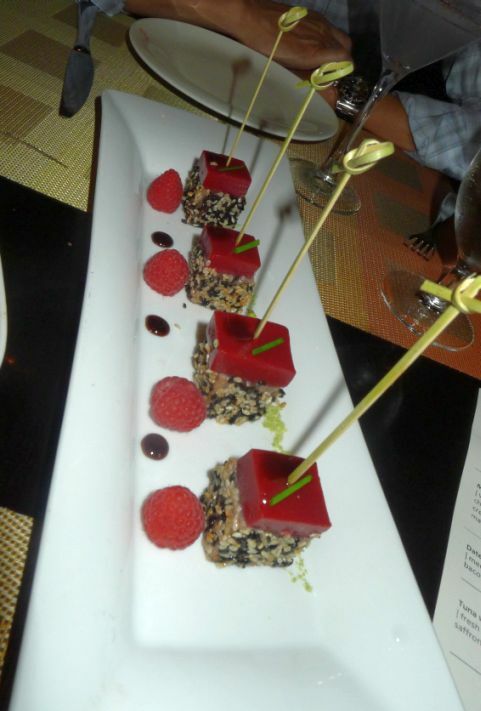 The food presentation was imaginative and colorful but the molecular raspberry tasted like Jell-O and the tuna was very bland. They have 3 little dots for the sauce which is not enough to enhance the taste of the tuna wrapped in black and white sesame seeds. 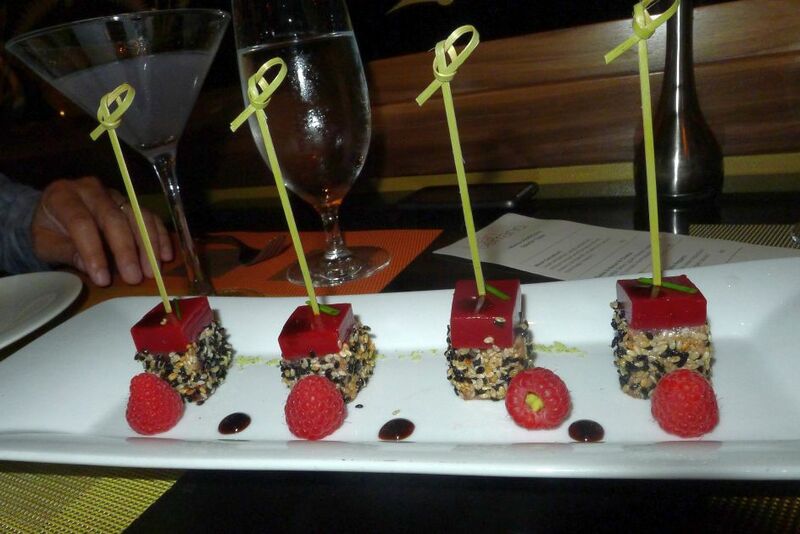 The first plate was eye candy but I was a bit disappointed in the taste. I like this dish! 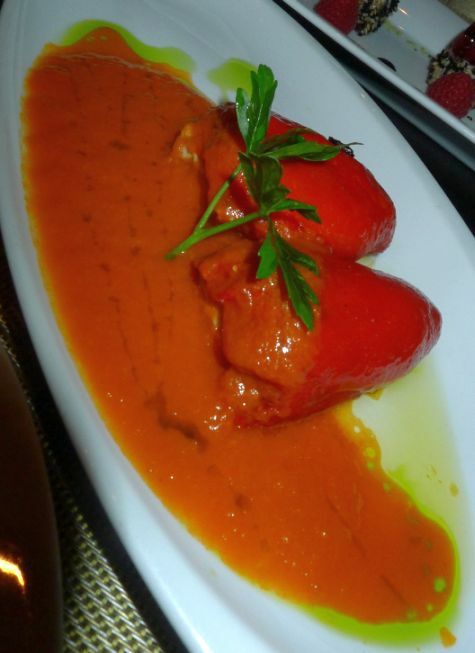 The tuna is this dish is flavorful and the sauce was also very tasty. I find myself mopping a lot of the sauce with a piece of bread! Another excellent dish! 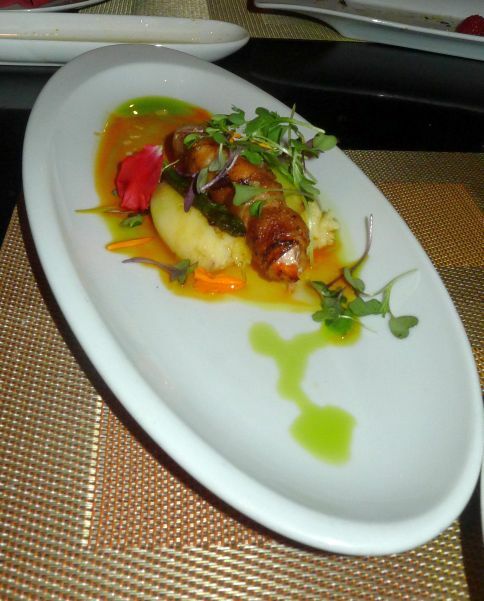 The lobster was cooked perfectly and the Iberian pork (bacon like) wrapped around the lobster is flavorful and also crispy! So far so good...Let's continue with more plates. 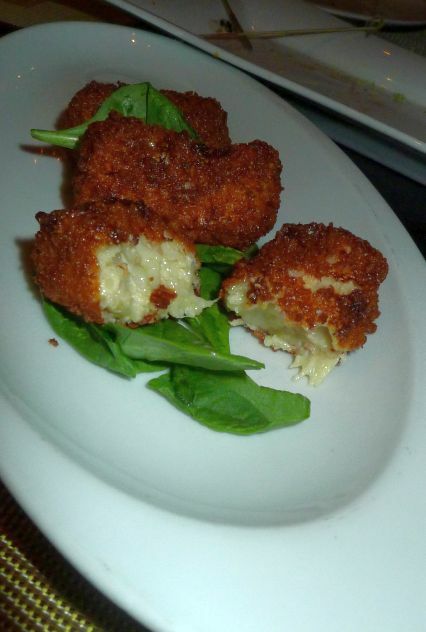 Traditional Spanish Chicken Croquetas [$8.00] Chicken in Béchamel sauce. It's hard to go wrong with these tasty chicken and béchamel fritters. I appreciated the crisp golden brown exteriors, yielding to warm, oozing, creamy centers. Very nice! There are 4 croquetas per order but Hoa ate one before we took a picture. 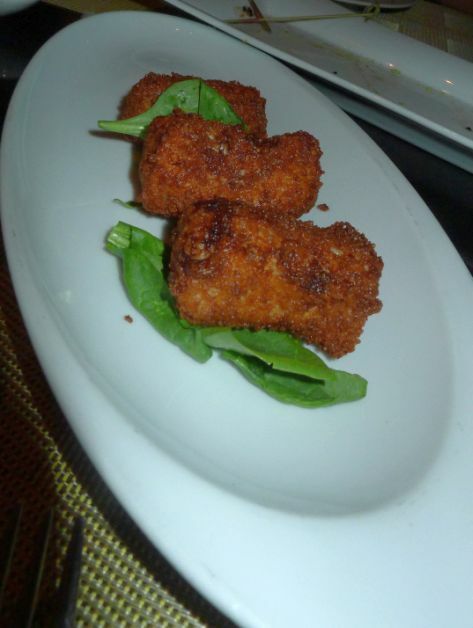 Croquettas are very popular in Spain simply because they are crunchy, tasty and simply delicious! 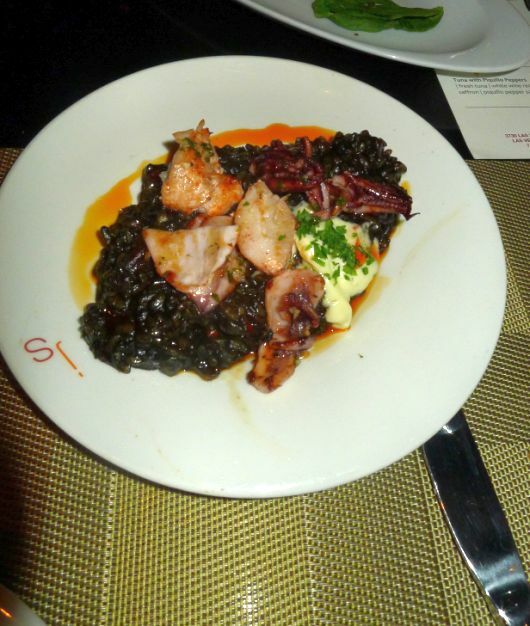 This is the first time I had risotto with squid ink and I have to say it was heavenly. The rice was creamy and perfectly cooked. 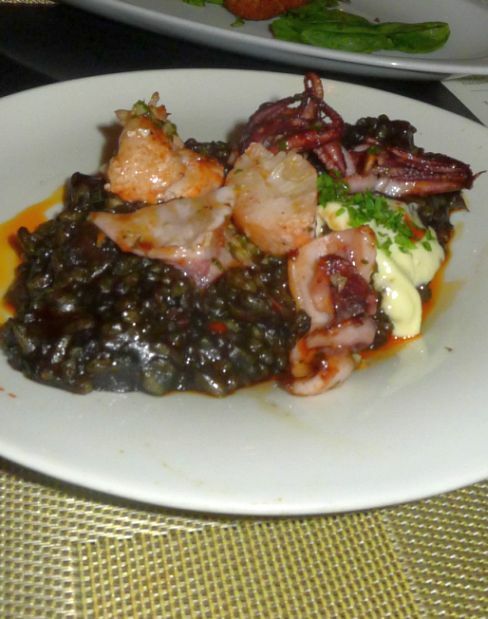 The sautéed squid, and lobster meat were a perfect marriage with the black risotto. I was warned that the squid ink usually is pretty salty and has a fishy smell but here it was perfectly seasoned and has a very pleasant aroma. Hoa and I really enjoyed this dish. The beef was nice and tender but unfortunately was overcooked so it pretty much kill it for me. 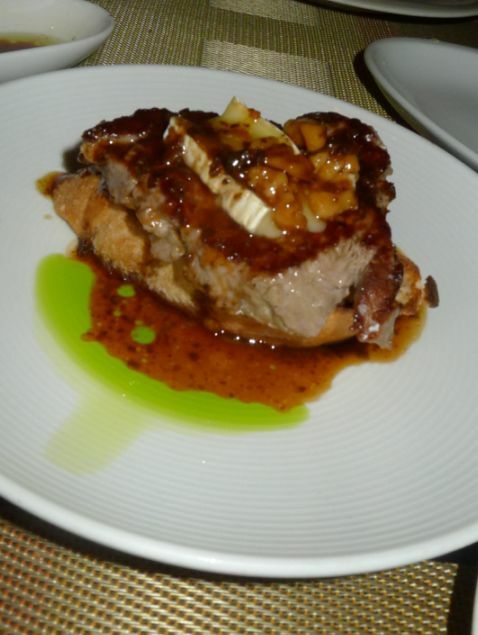 Nice presentation, good sauce, I also like the melting brie on top of the beef. Too bad it was overcooked! Yep, we cleaned up all the Tapas plates! 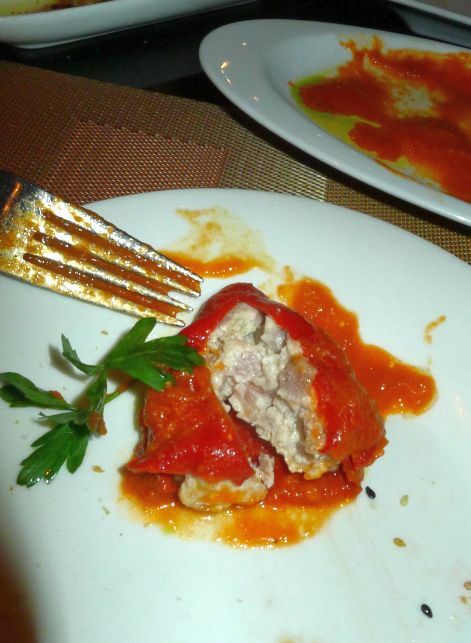 The food while good was simply not up to par with the impressive presentation. So out of the 6 plates we tried out, 2 did not make the cut but overall we did have a pretty good meal. My other complaint is that the food was brought out way too fast! We ate a 6 course meal in about an hour or so. I felt like they brought the next plate even before we had a chance to finish what we were eating. 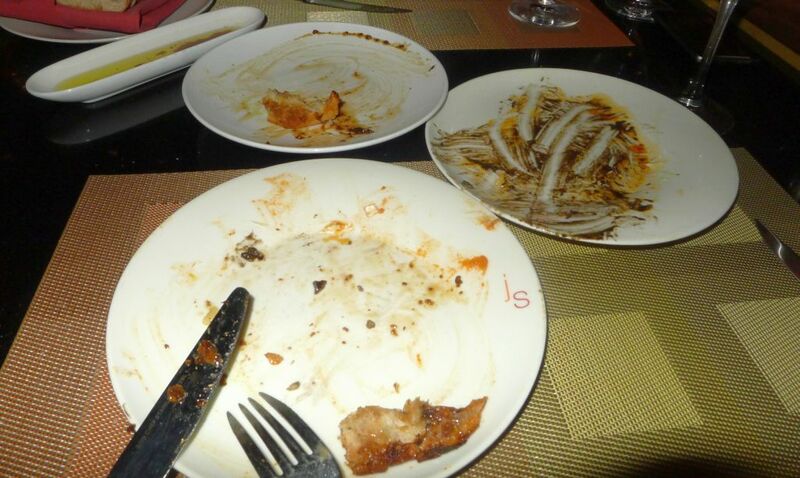 There were barely any pause between each plate so I felt we were a bit rushed. They could slow the pace down a bit for us to enjoy our wine and take a little break in between, but the food kept coming at a rapid paste! 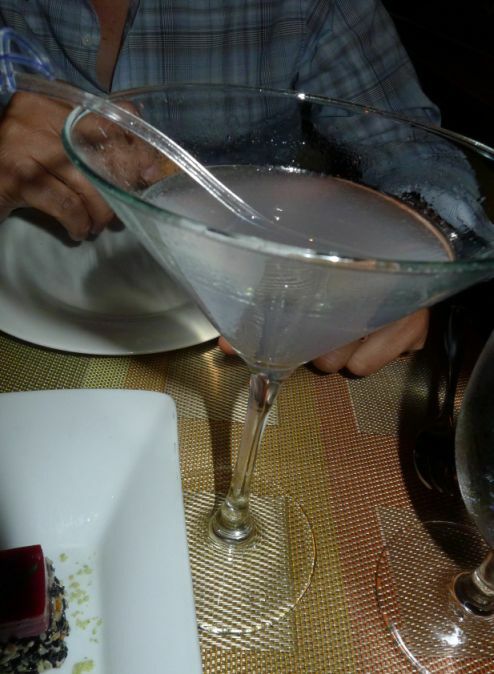 The service was excellent and our waitress was very attentive to our need and she was very generous with the wine. Hoa ordered a glass of red wine and she fill it up to at least 2/3 of the glass!